The gullibility of so many urban voters on the subject of energy issues, their energy ignorance quotient, never ceases to amaze but it is easily explained. The degree to which urban voters are susceptible to boneheaded ideas about energy, that is to say their energy ignorance quotient, is quite remarkable. This is why we see such foolishness with regard to the NESE pipeline, for example. There is an explanation; vast portions of the urban population don’t pay directly for their energy. Many U.S. households do not pay energy utilities or other suppliers directly for using electricity, natural gas, fuel oil, or propane but pay indirectly through rent, fees, or to a third party such as a housing authority. 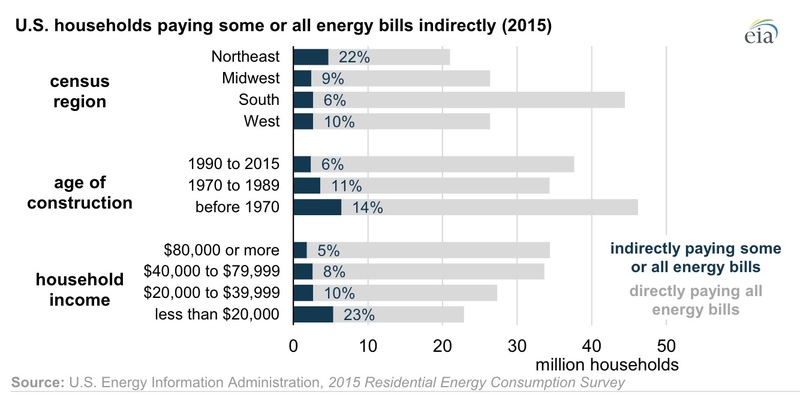 Data from the most recent Residential Energy Consumption Survey (RECS) show that, in 2015, 12.4 million of the nation’s 118 million households (11%) paid some or all of their energy costs indirectly. 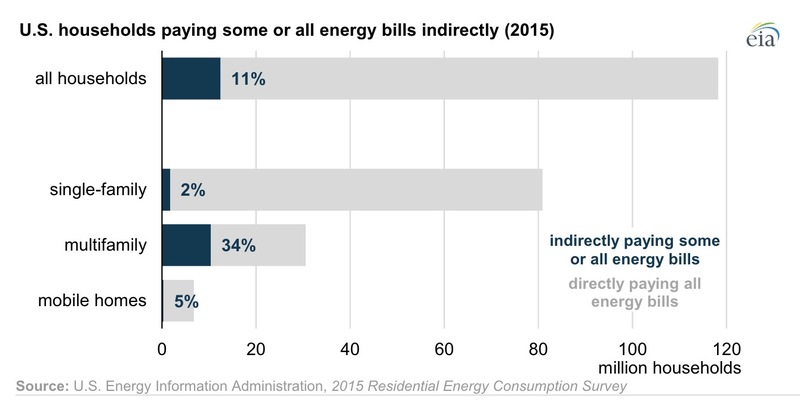 Indirect payment of energy bills was more likely for households in multifamily buildings, where 34% made indirect energy payments, compared with single-family homes, where only 2% made indirect energy payments. Households in the Northeast were most likely to pay for energy use through rent, fees, or some other arrangement (22%). The Northeast region has the highest share of apartment homes and homes built before 1970. Indirect payment arrangements were least common in the South region (6%), the area with the lowest share of apartment homes and households in older homes. Indirect payments of energy bills are also more common in lower-income households: 23% of households making less than $20,000 paid some or all of their energy bills indirectly, compared with 5% of households making $80,000 or more. Indirect payment of energy bills is considered a market barrier for increasing energy efficiency. If a household’s energy expenditures are not directly linked with its energy consumption, these households may have less financial incentive to install energy-efficient appliances or lights, or to lower thermostat temperature settings when away from home. Yes, more than a third of multi-family households and almost a quarter of all households in the Northeast do not pay directly for their energy; hence their astounding energy ignorance. If you do not pay the electric bill yourself, you are less likely to turn the lights off behind you. It’s a fact of human nature. It’s also why urban voters are more apt to support vague green energy propositions they don’t suppose will cost the anything. Instead, they complain “the rent is too damned high” while holding up signs opposing pipelines and remaining blithely ignorant of one the causes; the corporatist subsidy schemes advanced by governors such as Cuomo and Murphy to appease green special interests. What this data tells is that those of us supporting natural gas need to direct more of our resources to addressing this energy ignorance. We need to focus more on the economics and the outrageous costs of green energy scams to ordinary householders. We have an energy ignorance problem.